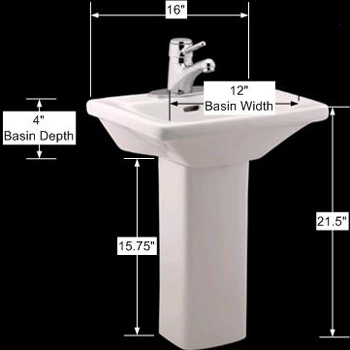 Child-size sinks: Child-size rectangle pedestal sink makes it safe and easy for children to clean up all by themselves. Easy-reach height means less mess and more independence for your child. 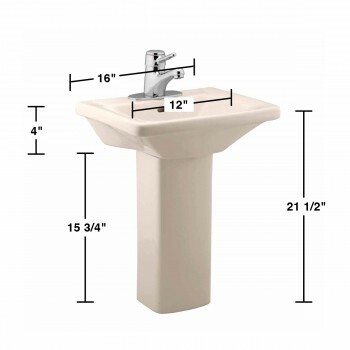 This rectangle pedestal sink Grade A Vitreous China for strength and durability. Accepts a compact 4 in. center set faucet, sold separately. Overflow hole prevents water from overflowing onto floors. Suitable for residential and commercial uses, swaps out with ease for installation. Matches Kid's Loo Toilet, sold separately. Measures 21 1/2 in. height x 16 in. width x 12 3/4 in. projection. Does not include mounting hardware.